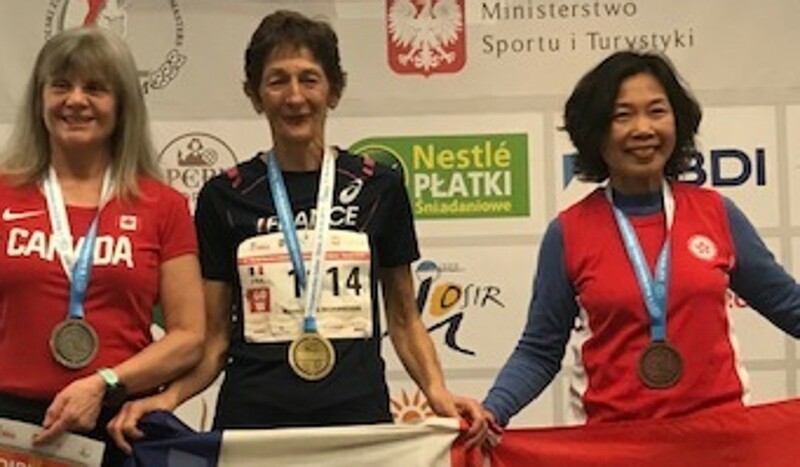 Catherine Kwan Siu-yin bagged a podium spot at the World Masters Athletics Championship Indoor and hopes her success will inspire others. “I wish this could raise the community’s support of masters athletics and veterans’ awareness of continuous exercise for good health,” she said. The Masters championship is divided into five-year age groups so athletes can compete against their own age. Kwan came third in the women’s 60 category, 3,000 metres distance, in Torun, Poland. “It is quite difficult to recognise your position during the race as there could be more than one age group in the same race,” Kwan said. Kwan has won a number of races, including gold in the 5,000m track walk at the 2012 and 2016 Asia Masters Athletics Championships in Taipei and Singapore respectively. But in Poland, she experienced something new – the track was shaped so it was on a slope, like a cycling velodrome. Next up, Kwan is walking in a local race in May, then the Hong Kong Masters Championships in October and November. Not only does she hope her success will inspire other veterans, but it will dispel some myths about racewalking. “Some people still feel strange about racewalking as we have to wriggle our hips to maximise the stride efficiency,” Kwan said. Working out is fun – so why do we call it ‘work’?